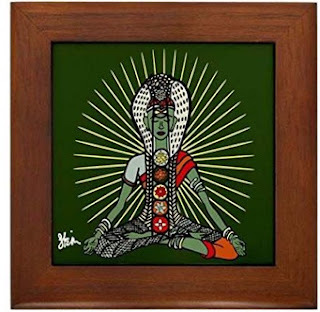 Artist Kristen Stein : Art, News & More: Framed Art Tiles Available on Amazon. Framed Art Tiles Available on Amazon. I’ve reintroduced some of my art tiles on Amazon. These look great alone or displayed as a multiple set. They can withstand heat if you’d like to use them as hotpads or trivets. The framed art tiles can be displayed on the wall using a small nail hole on the back, or displayed on a table top by inserting a small dowel rod (included) into the bottom most hole on the back to create an easel-type display. A total of 26 are currently available in small quantities on Amazon. Please contact me if you are interested in my other designs.